Autumn is my favorite season, and it is just around the corner! I love the chill in the air and the crunch of autumn leaves when you walk. The food that the season brings is by far my favorite to cook (and eat!). Lately, I have been turning to crostatas—which are open-faced pies—and filling them with different combinations of fruits and adding a little twist to the crust, white pepper! The pepper is such a wonderful contrast to the sweet fruits and really adds the perfect amount of spiciness, which creates a delicious combination of layered flavors. Crostatas are often my “go-to” for entertaining. I can make the dough ahead of time and leave it in the refrigerator. Not long before my guests arrive I gather my combination of fruits and other ingredients, throw it all together, and fill the house with a fabulous smell to welcome my guests. Not only is the house filled with a beautiful fragrance, but your guests will think you have been baking all day. 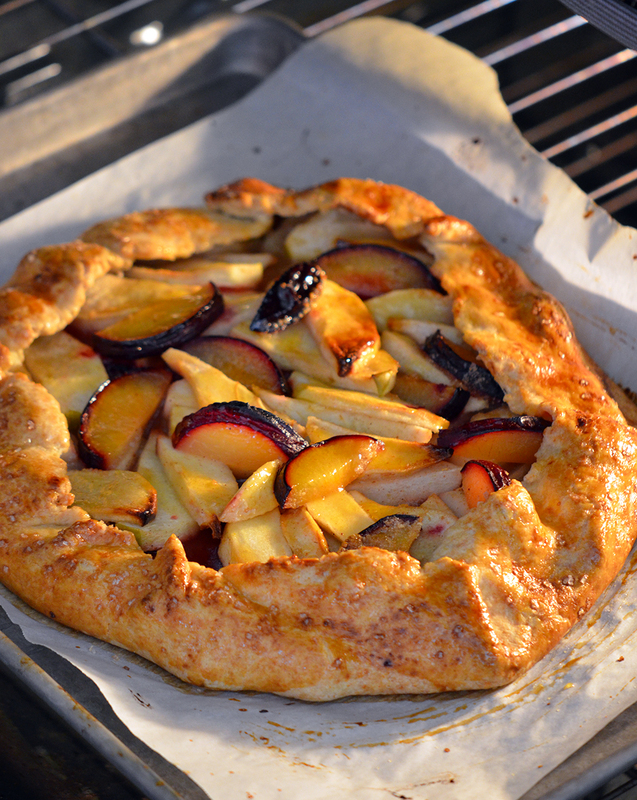 My Fall Fruit Crostata is perfect for a first course, brunch, lunch offering with a salad, or for dessert with vanilla-bean ice cream. It is a fabulous dish for any soirée! In the bowl of a food processor fitted with a steel blade, add 1 ½ cups of flour, butter, 1 tablespoon of sugar, white pepper, and sea salt. Pulse the food processor 10 times or until the butter is the size of small peas. Add the Comté cheese and pulse 2 more times. Next, with the food processor running, slowly add the cold water down the feed tube. As soon as the dough forms a ball, turn off the food processor. Turn the mixture out onto a lightly floured surface and quickly shape it into a disc. Cover the dough in plastic wrap and refrigerate for 30 minutes. Meanwhile, in a large bowl combine the apples, pears, plums, lemon juice, ½ cup of sugar, 2 tablespoons of flour, honey, cinnamon, and nutmeg. Toss to evenly coat the fruit and set aside. Remove the dough from the refrigerator and place onto a lightly floured surface. Roll out the dough to form a circle that measures 15-inches by ½ -inch thick. Transfer the dough to a parchment-covered sheet pan. Sprinkle evenly with breadcrumbs. Spoon the fruit and the juices onto the pastry, leaving a 2-inch boarder from the edge. Turn the edge of the pastry in over the fruit. Brush the dough with egg wash. Sprinkle the dough with course sanding sugar. Bake for 60-80 minutes, or until golden brown. Remove from the oven and brush the entire top with apricot glaze. In a small saucepan set over medium heat add 1/3 cup of apricot jelly and 2 teaspoons of spiced rum.